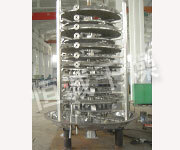 Description: PLG series continuous plate dryer is a kind of high efficiency conducting and continuous drying equipment. Its unique structure and operating principle provide advantages of high heat efficiency , low energy consumption, less occupying area, simple configuration, easy operation and control as well as good operating environment etc. 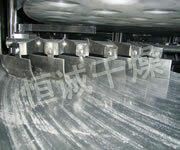 PLG series continuous plate dryer is a kind of high efficiency conducting and continuous drying equipment. Its unique structure and operating principle provide advantages of high heat efficiency , low energy consumption, less occupying area, simple configuration, easy operation and control as well as good operating environment etc. It is widely used in drying process in the flelds of chemical, pharmaceuticals, agricultural chemicals, foodstuff, fodder,process of agricultural and by-products etc., and is well received by various industries. Now there are three big categories, normal pressure, c losed and vacuum styles and four s pecifications of 1200, 1500, 2200 and 2500; and three kinds of constructions A (carbon steel), B (stainless steel for contact parts) and C (on the basis of B to add stainless steel for s team pipes, main shaft and support, and stainless steel linings for cylinder body and top cover).With a drying area of 4 to 180 square meters, now we have hundreds of models of s eries products and various kinds of auxiliary devices available to meet requirements of various products. 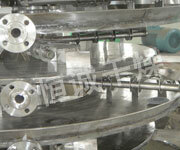 Wet materials are fed continuously to the top drying layer in the dryer . They will be turned and stirred continuously by harrows when the harrow’s arm rotates, the material flows through the surface of the drying plate along the exponential helical line. On the small drying plate the material will be moved to its exterior edge and drop down to the exterior edge of the large drying plate underneath, and will then be moved inward and drop down from its central hole to the small drying plate on the next layer . Both small and large drying plates are arranged a lternately so a s materials can go through the whole dryer continuously. 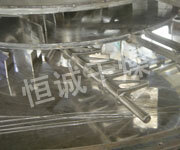 The heating media, which could be saturated steam, hot water or thermal oil will be led into hollow drying plates from one end to other end of the dryer. The dried product will drop from the last layer of the drying plate to the bottom layer of the smell body, and will be moved by harrows to the discharge port. The moisture exhausts from materials and will be removed from the moist discharge port on the top cover, or sucked out by the vacuum pump on the top cover for vacuum-type plate dryer. 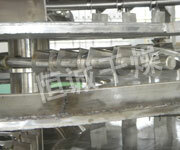 The dried product discharged from the bottom layer can be packed directly. 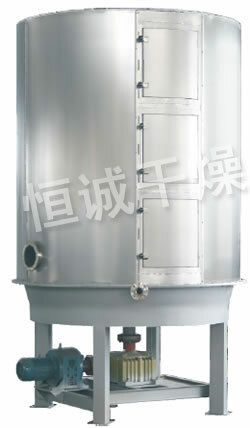 The drying capability can be raised up if equipped with supplementary devices such as finned heater, condenser for solvent recovery , bag dust filter, return and mix mechanism for dried materials and suction fan etc. solvent in those paste state and heat sensitive materials can be easily recovered, and thermal decomposition and reaction can be also carried out. ◎Regulate thickness of materials, rotating speed of main shaft, number ofharrow’s arm, style of and sizes harrows achieve best drying process. ◎Each layer of drying plate can be fed with hot or cold media individually to heat or cold materials and make temperature control accurate and easy . ◎Dwell time of materials can be accurately adjusted. ◎Single owing direction of materials without return owing and mixing,uniform drying and stable quality , no re-mixing is required. 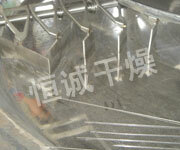 ◎After material feeding is stopped, they can be easily discharged out of the dryer by harrows. ◎Careful cleaning and observation can be carried inside the equipment through large-scale viewing window . 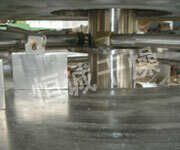 ◎Thin layer of materials, low speed of main shaft, small power and energy required for conveying system of materials. ◎Dry by conducting heat so it has high heating ef ficiency and low energy consumption. couldn’t float to the equipment, so there is almost no dust powder in tail gas discharged from the moist discharge port on the top. ◎equipped with solvent recovery device that can recover organic solvent easily from moist-carrier gas. 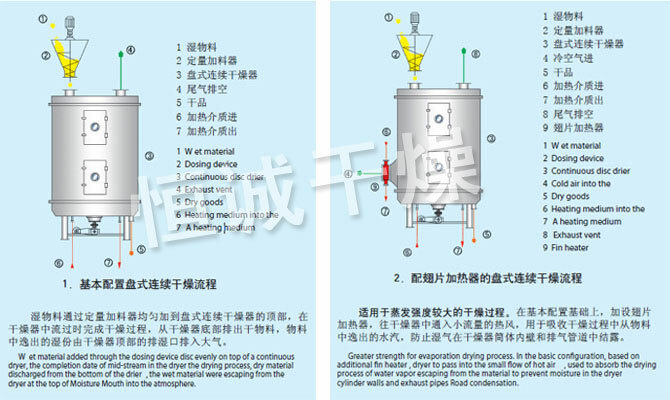 The solvent recovery device has simple structure and high recovery rate, and nitrogen can be used as moist-carrier gas in closed circulation for those subject to burning,explosion and oxidation, and poisonous materials in order for safe operation. Especially suitable for drying of flammable, explosive and poisonous materials. 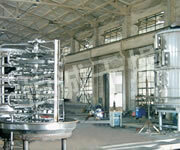 ◎if the plate dryer is operating under vacuum state, it is particularly suitable for drying heat sensitive materials. 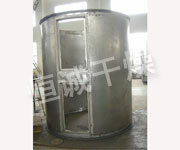 ◎As the dryer is in a whole for delivery , it is quite easy to install and fix at site only by hoisting. ◎As drying plates being arranged by layers and installed vertically , it takes a small occupying area though drying area is large. (1). Designing pressure: general is 0.4MPa, Max. can reach 1.6 Mpa. (2).W ork pressure: general is less then 0.4Mpa, and Max. can reach 1.6 Mpa. be heated by electric, oil of fused salt. (1).headstock revoluton:1~10 rpm, electromagnetism of transducer timing. (2).harrow arm: There are 2 to 8 pieces arm that be xed on the headstock on the every layers. (3). Harrow’s blade: Surrounding the harrow’s blade, oat together with the surface of the plate to keep contact. There’re various of types. (4). 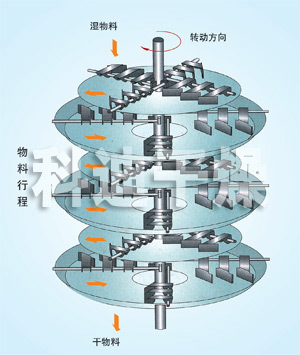 Roller: for the products easily agglomerate, or with the requirements of grinding, the heat transfer and drying process might be reinforced by placing roller(s) at the appropriate place(s). (2). 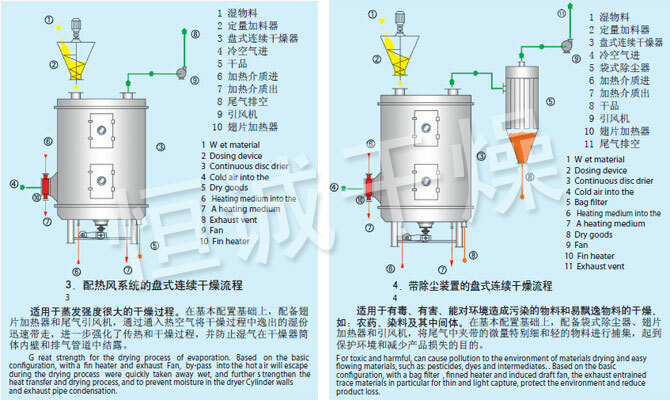 Sealed: Cylindrical shell, could bear the interior pressure of 5KPa, the main ducts of the inlet and outlet of heating media might be inside of the shell or outside. main ducts of inlet and outlet is inside of the shell. Normal for the application of big evaporation capacity to increase drying ef ciency.